A Thought: Growing. 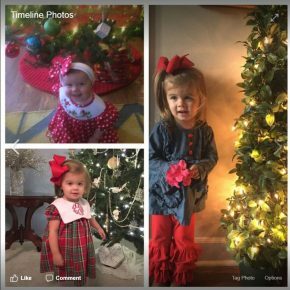 Looking over these pics of Laine Austin from 2015, 2016 and 2017 Christmas seasons, I see how much she’s grown. She is growing not only physically, but also intellectually and spiritually. Her mental growth is as evident as her physical growth, as she speaks in full sentences and asks lots of questions at two and a half years of age. Her spiritual growth is not as evident as the other two, but her singing ‘Jesus loves Me,’ and attempts at ‘Away in the manger,’ are impressive, along with her robust ‘ Amen!’ at the end of hymns in worship. How are we growing spiritually?